The instructions are enclosed. You can also read about how to make the gloves on the page with instructions. This photo was sent in by Shirley Drayton from Ocean Grove, Australia as her Best Project Contest 2012entry. To read more about the project go to the customer's page. This photo was sent in by Dorthy Privett from Harrisburg, Arkansas as her Best Project Contest 2012entry. To read more about the project go to the customer's page. 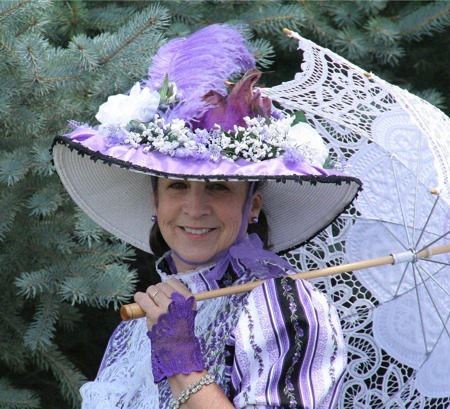 This photo was sent in by Janet McBride from Lovell, Wyoming, who makes historical Victorian dresses. You can read more about the project on the customer's page. This photo was sent in by Janet McBride from Lovell, Wyoming as her Best Project Contest 2016 entry. You can read and see more pictures on the entry page.